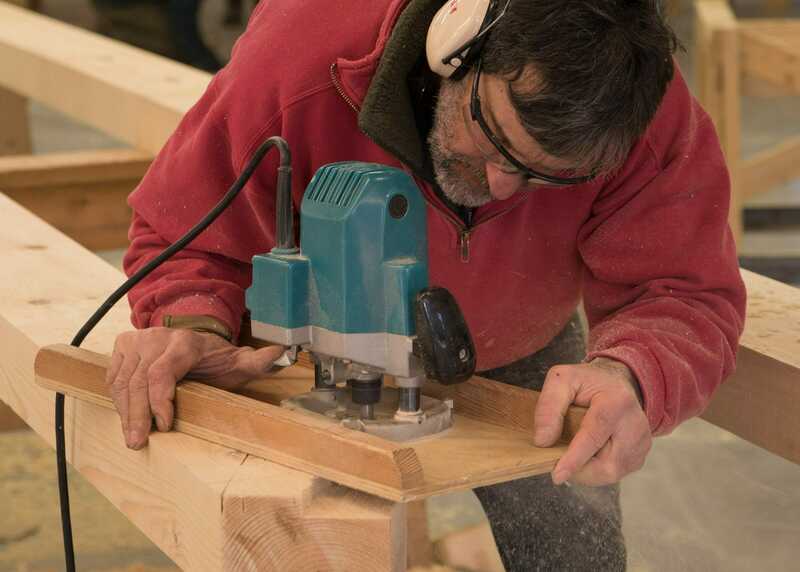 We handcraft all of our timber frames to suit the needs of each client. 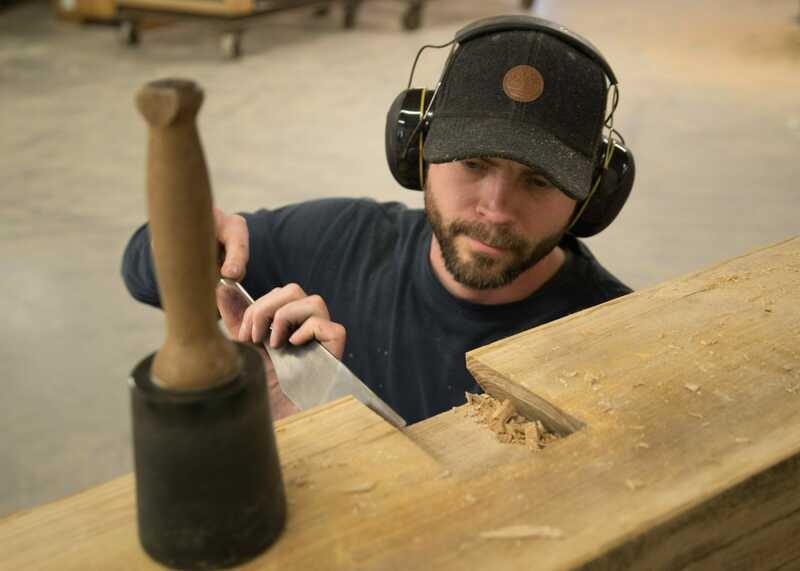 We use a variety of woods and finishes. 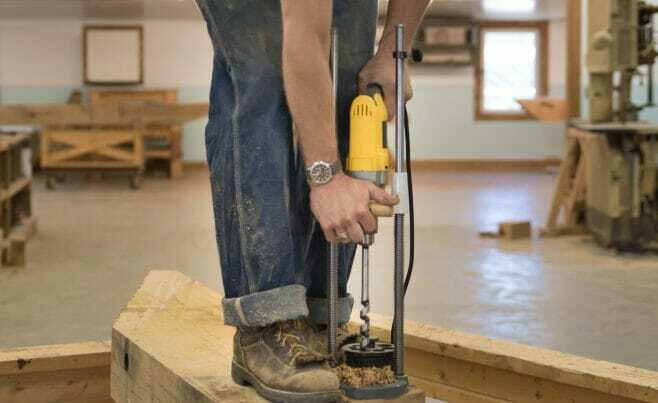 We do not build standard post and beam kits. 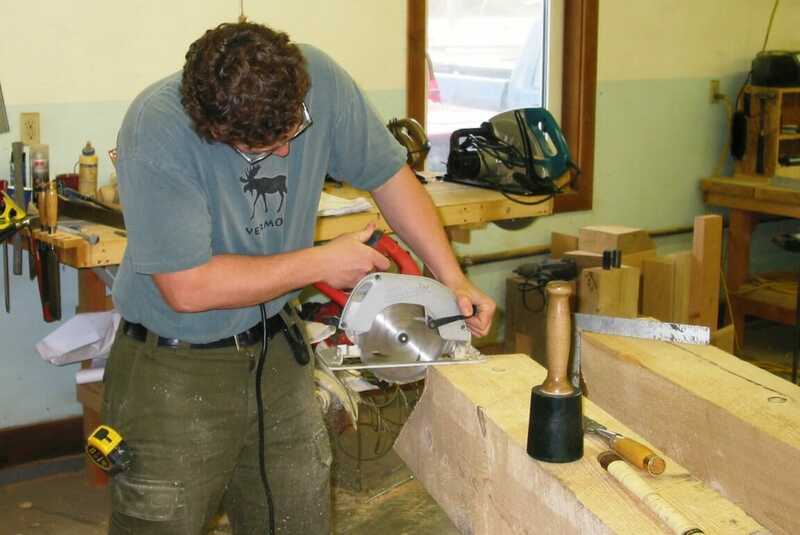 Instead, we match each clients’ need with a timber frame custom designed for them. 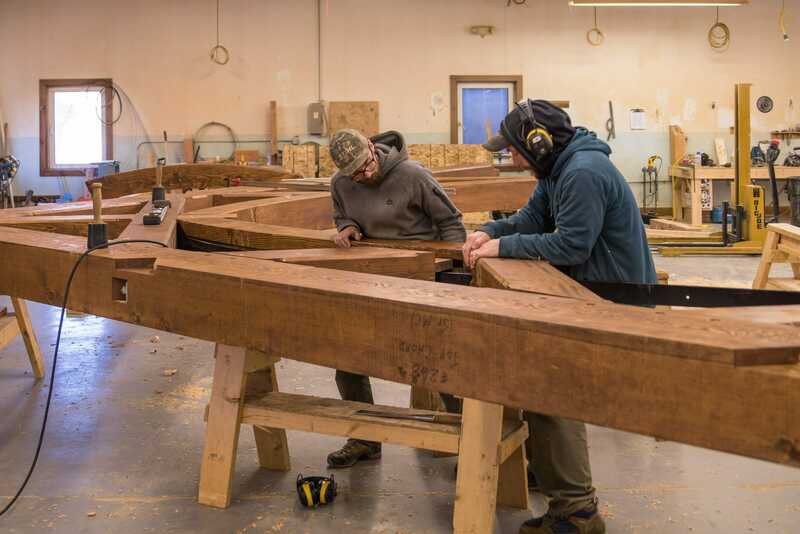 Then ship the timber frame as a kit for the owner or our crew to assemble and raise. 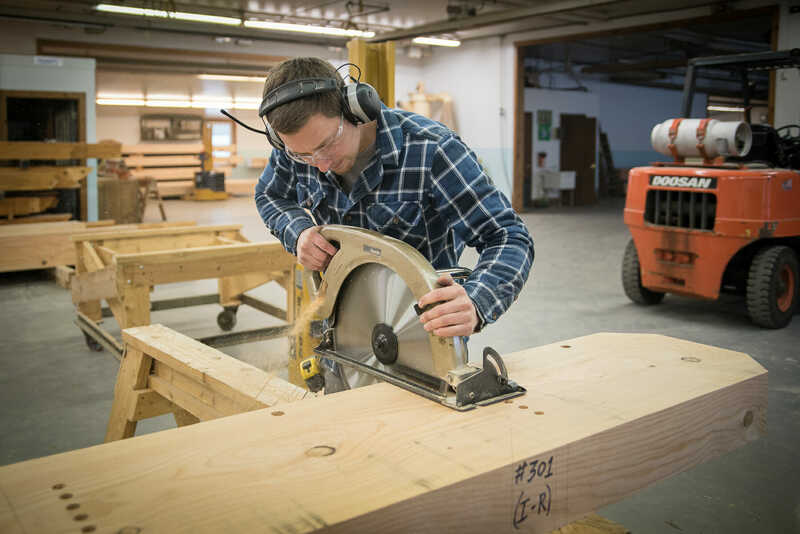 Scroll down the page to see the system and techniques we use to cut, finish, assemble, and raise custom timber frames. The process begins with a 3D design that we create from our client's plans and ideas. 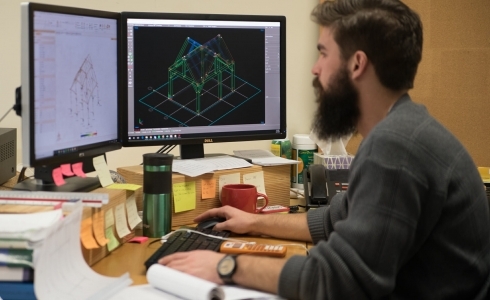 Once preliminary drawings are provided by our clients' architects or after we complete a 3d preliminary design, the project goes to Richard, our estimator. He will often do a sketch and then will make a material list for pricing. 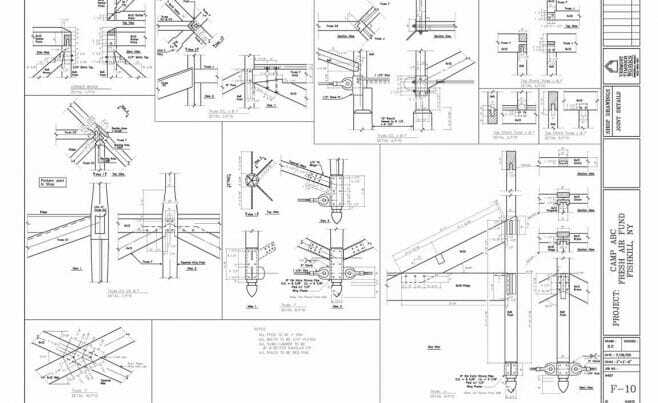 When the price has been approved by our client and a deposit received, we prepare detailed shop drawings. 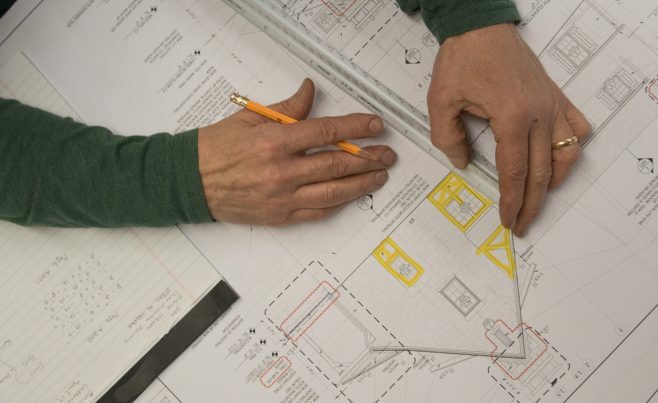 The shop drawing process takes place in two parts. 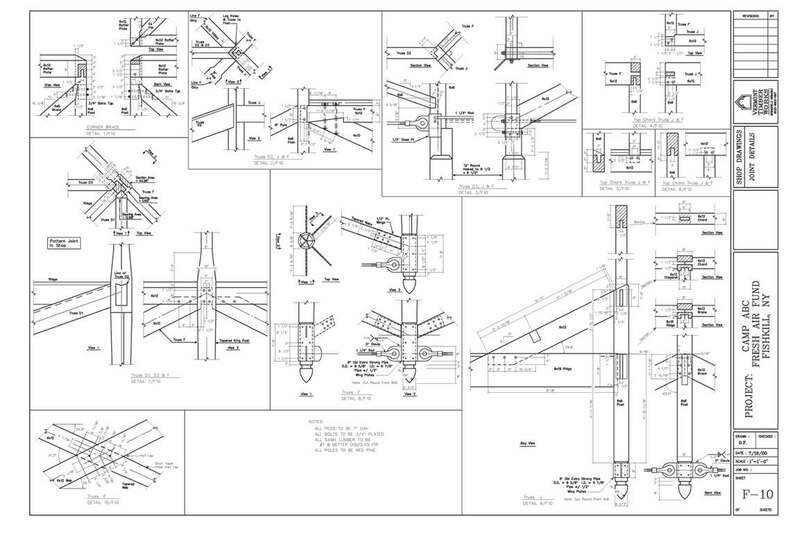 First, preliminary drawings are provided for engineering review and material order. 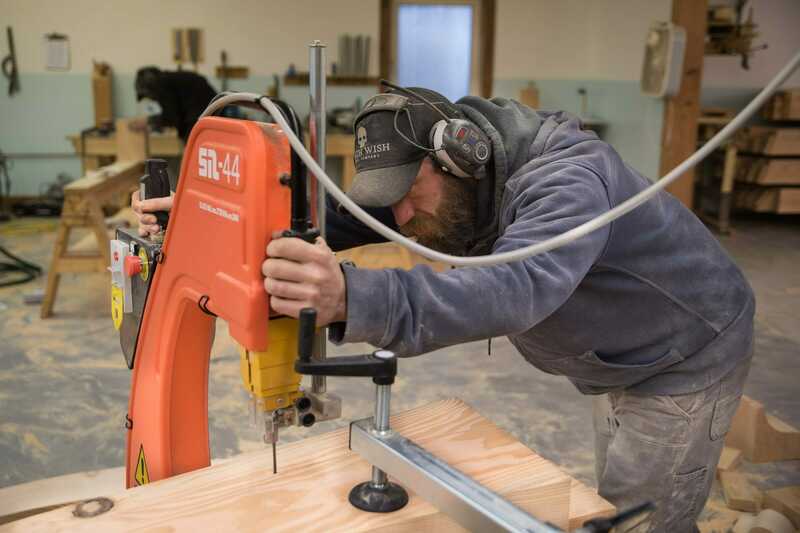 Second, we detail all the individual parts and their joinery for the fabrication team to use in the shop. 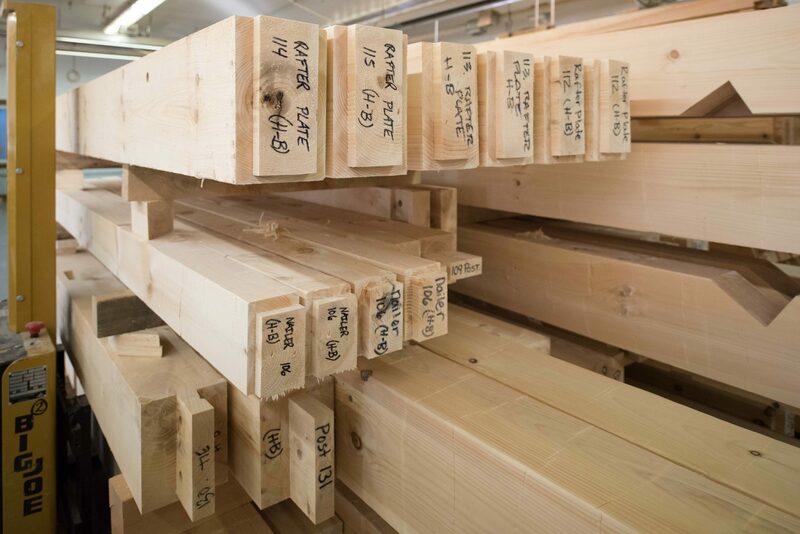 After a timber order is placed, raw beams are sent to us from the sawmill. 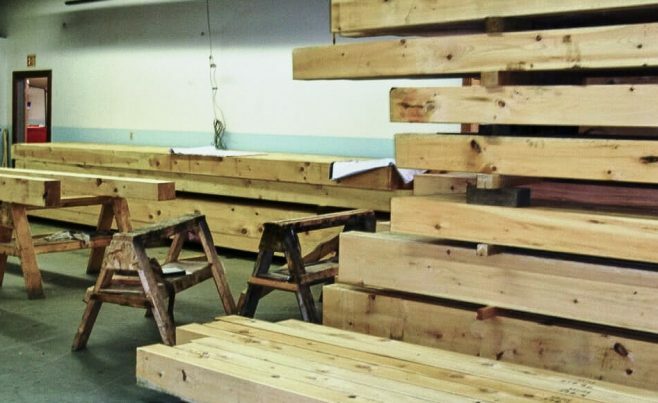 This photo shows rough timber that is stacked in our shop and is ready for layout. 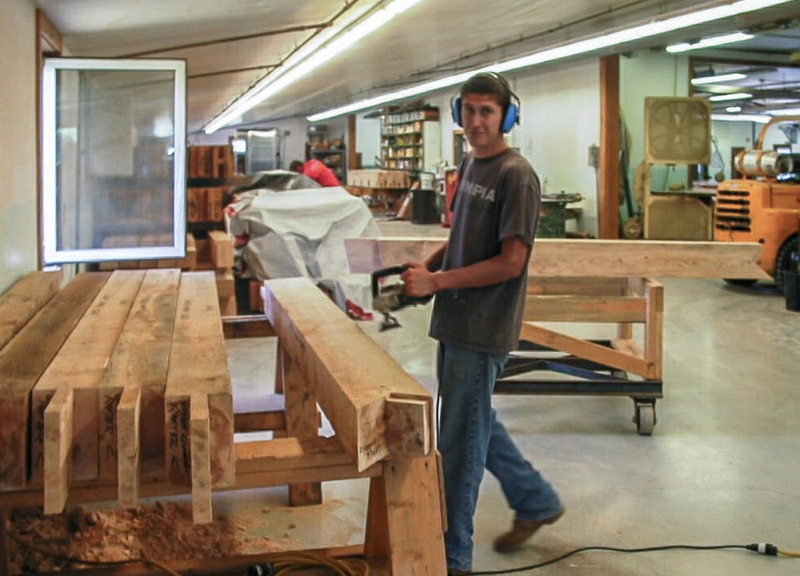 All of our frames are laid out and cut by hand. Pencil marks are drawn on each piece of timber to show the crew where each cut is to be made. 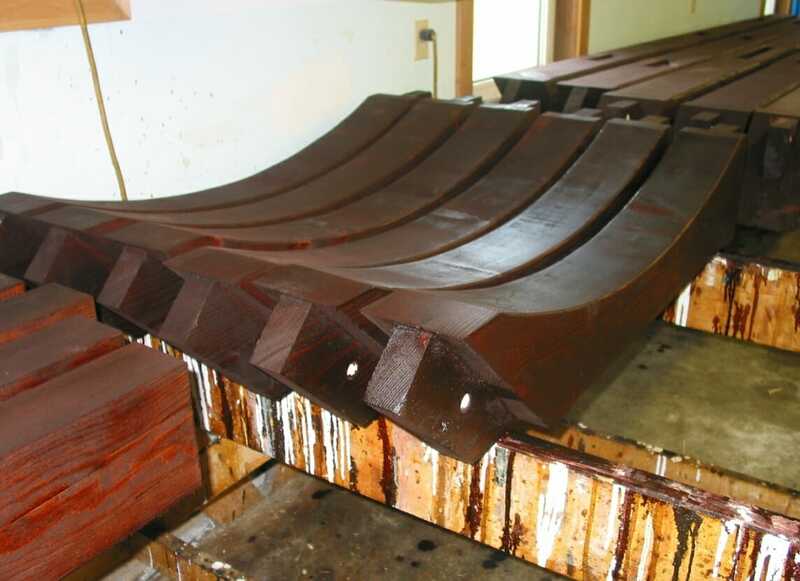 Every beam is oriented for strength and crown appearance (the best side is placed in the most visible location). 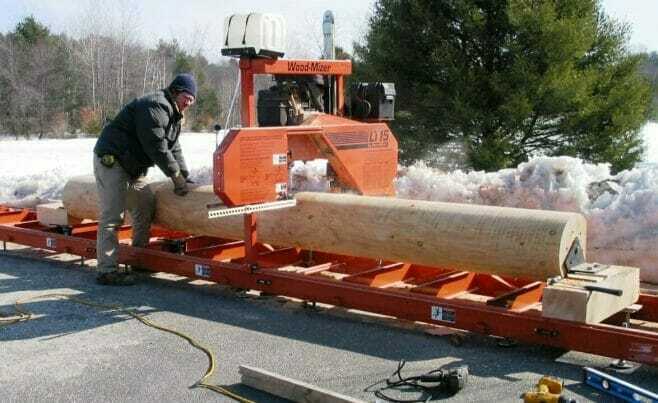 Once the beams are marked they get placed on stands for cutting. 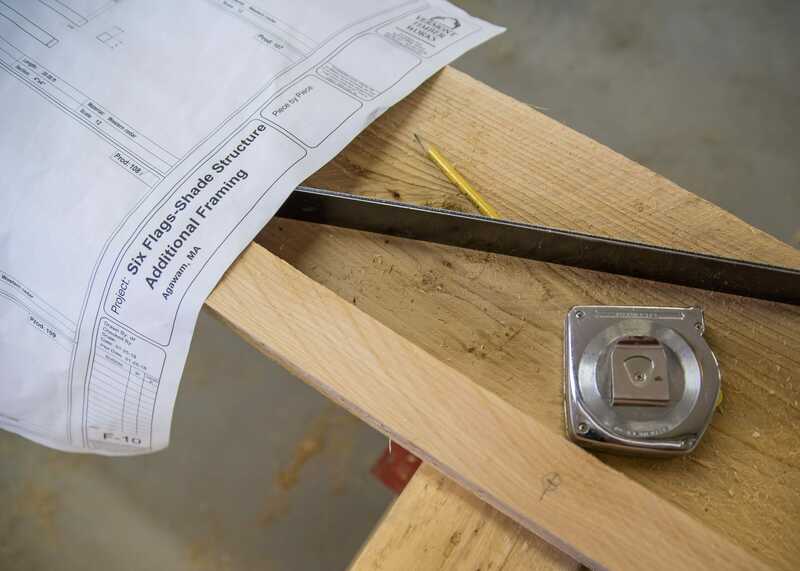 Our timber framers alwasy double check each mark to make sure that they match the plans before making the cuts. 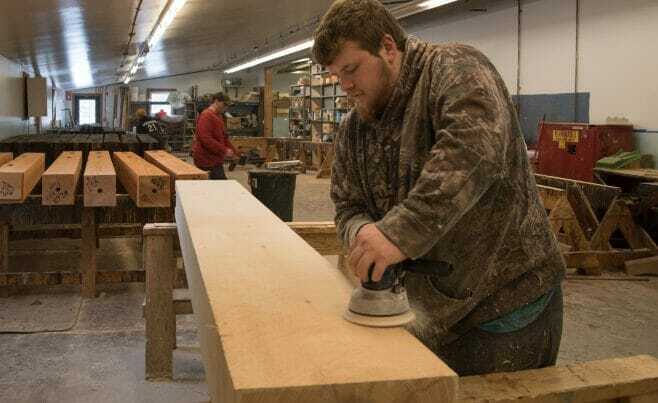 Cody begins the cutting process by punching a mortise into a beam. 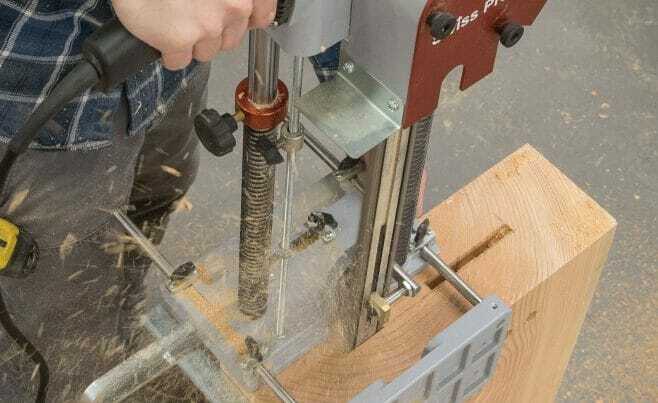 Next he will notch, drill and cut the beam to length. 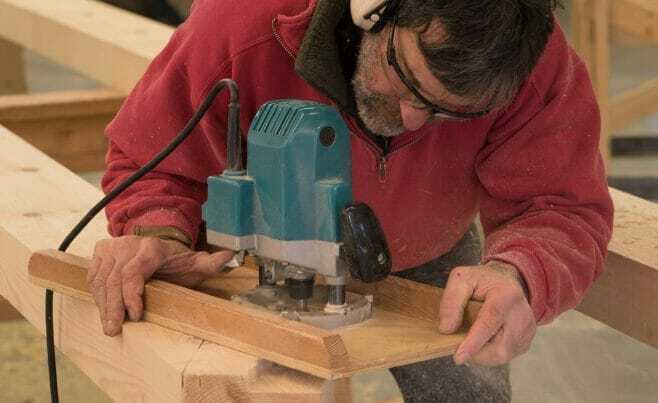 Amos cuts precise joints with a sharp chisel into a heavy oak beam. 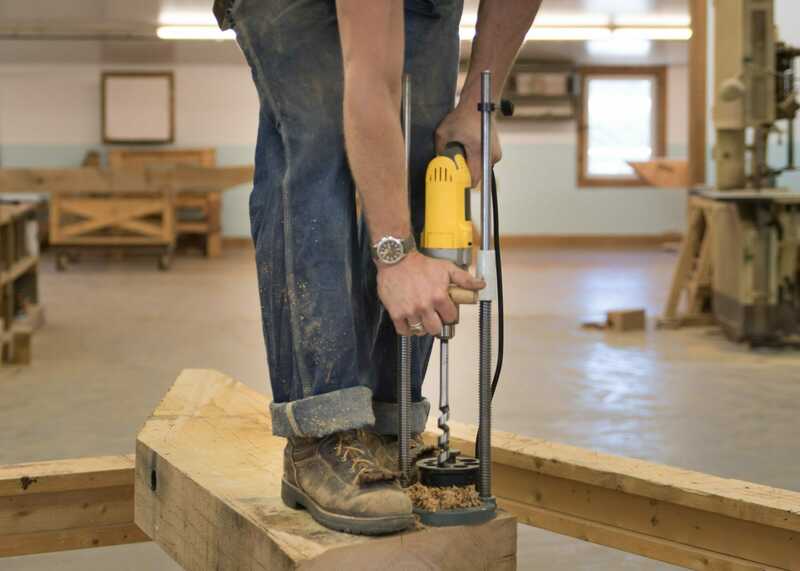 Each and every joint has to be precisely cut and positioned to ensure that all the components of the frame fit perfectly together. 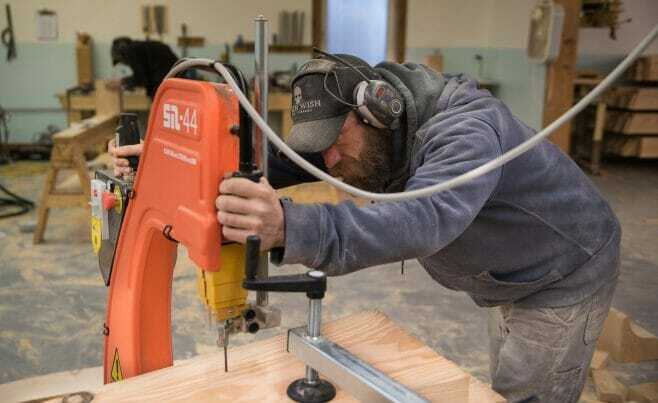 Ethan uses a hand held drill mounted in a drill guide to cut peg holes in the timber. 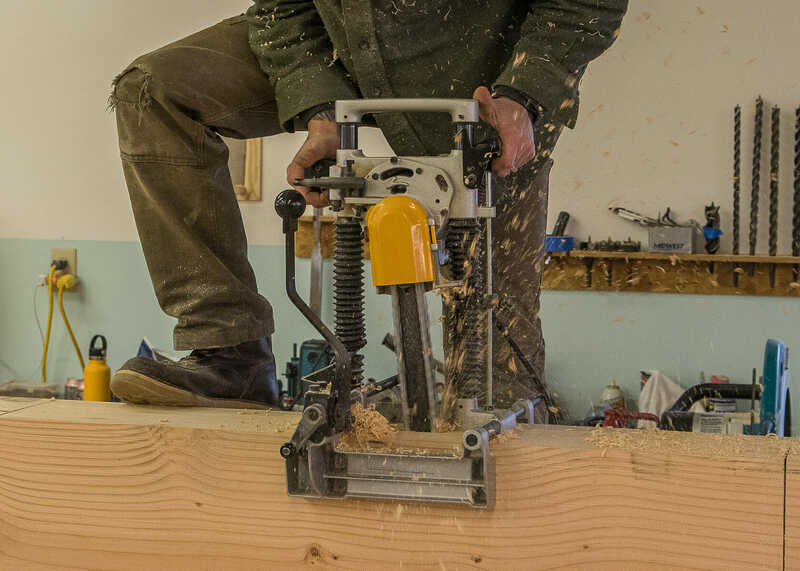 William uses a router to make accurate cuts on the end of a timber and match the computer generated specifications. Richard guides the band saw along the curve marked on the timber. 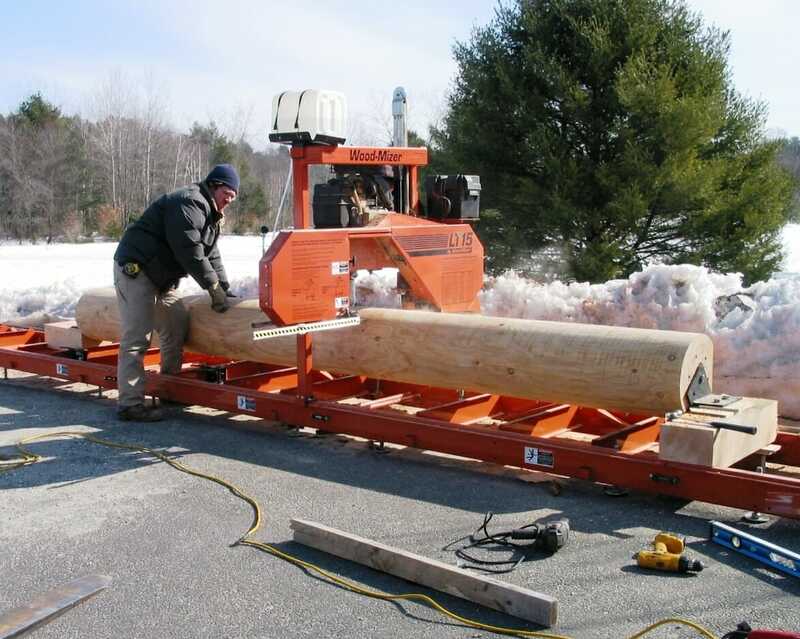 Our framers use this specialized machine to cut narrow grooves in timbers. This groove will receive a steel plate. 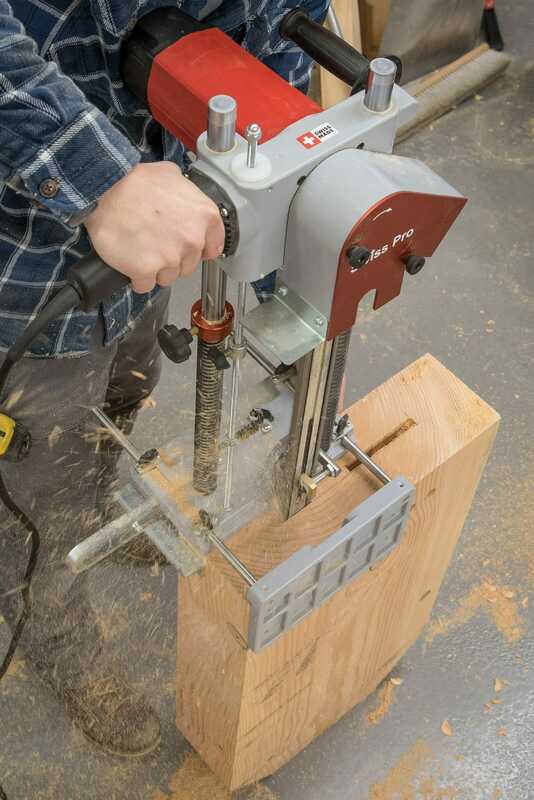 A framer uses the band saw to reshape a round column. Most of the timber we use is sawn at mills that we have been buying from for years. 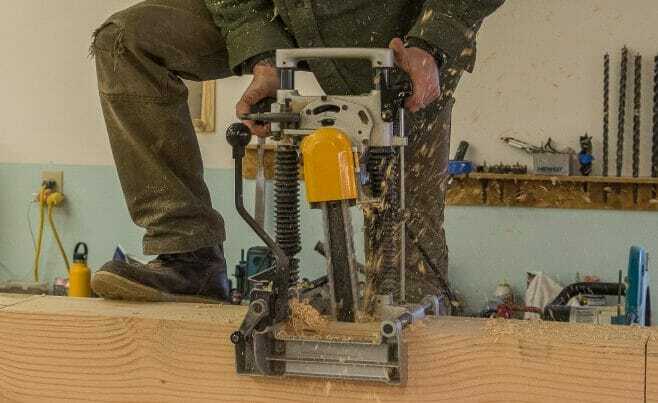 Occasionally we re-saw timber ourselves for small jobs, or use our precision band saw mill to rip angled faces on beams. 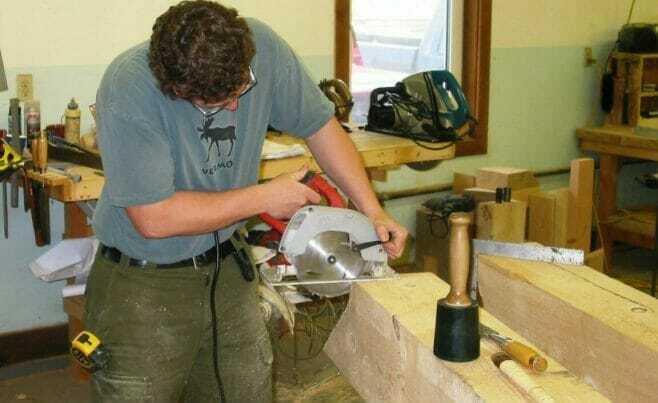 Small saws are used to cut detailed joinery. 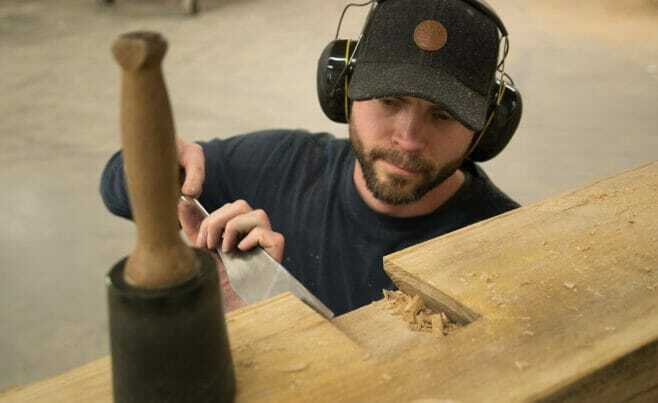 Todd uses a whisker wheel to clean up rough sawn timber. 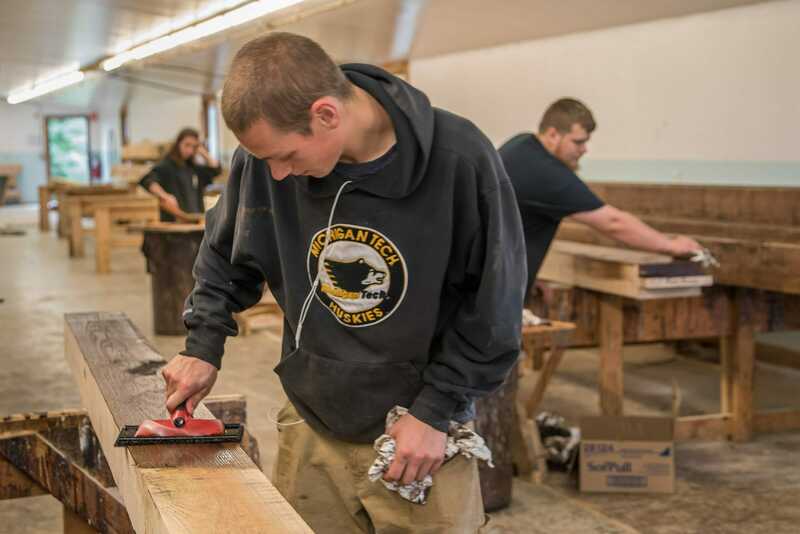 The timbers are cleaned after all the cuts have been made and before they are stained. 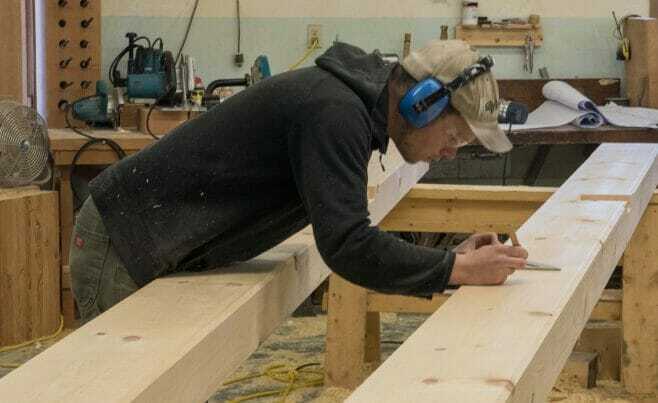 Tyler sands one of the timbers to be semi-smooth on all four sides. 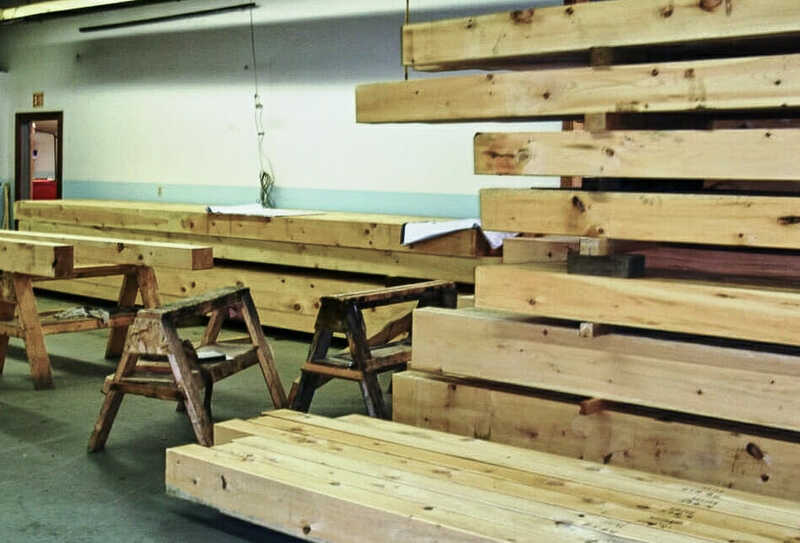 This stack of douglas fir beams is ready for stain or urethane to be applied. 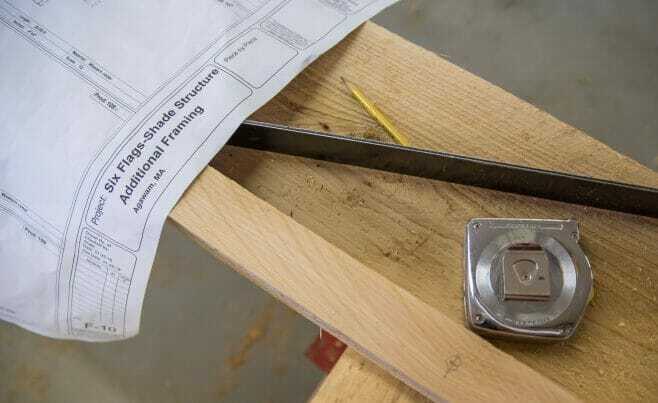 All the joints are cut, the peg holes have been drilled and each timber has been individually marked on the end according to its exact location in the frame. 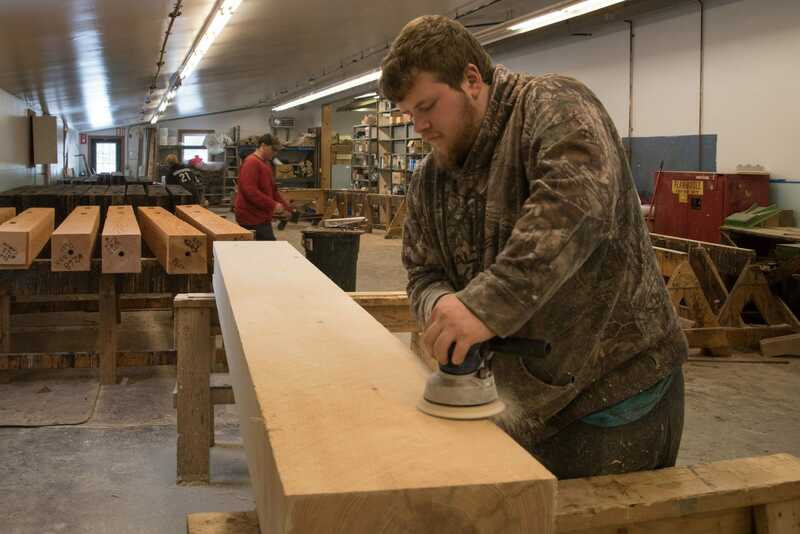 A framer applies Minwax stain to sanded Douglas Fir with a paint pad. Stain is applied to every beam on all four sides and in all the joint pockets. 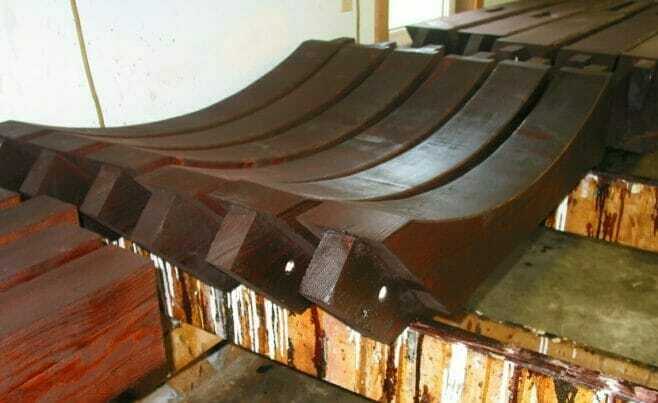 Arched braces dry after they received a coat of dark stain and a coat of urethane. Notice that all surfaces of the brace have been sealed. The final coat of urethane protects the timber and gives it a nice finish. 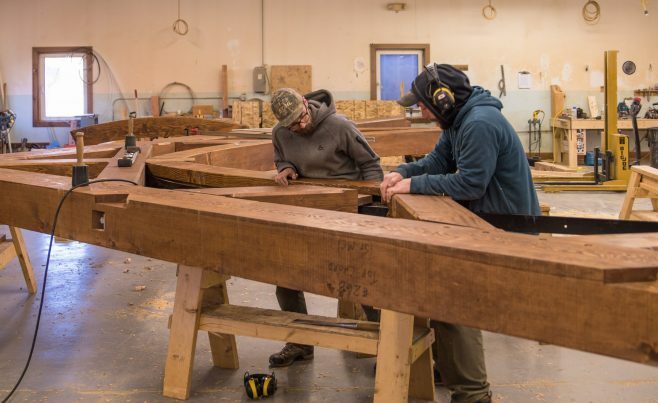 We assemble trusses in the shop when they are less than ten feet tall, and then ship them assembled, ready to be installed. 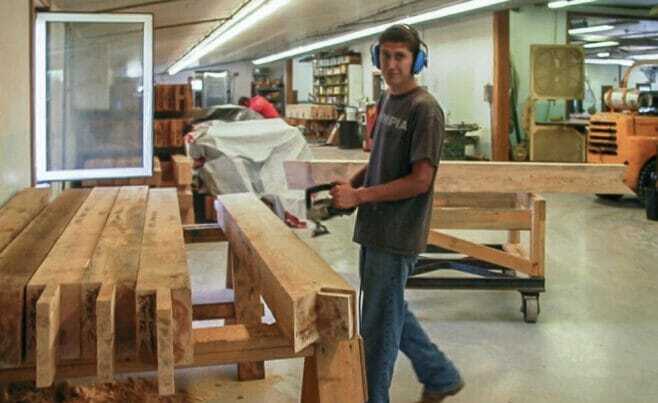 We ship trusses unassembled when they are larger than 10 feet. 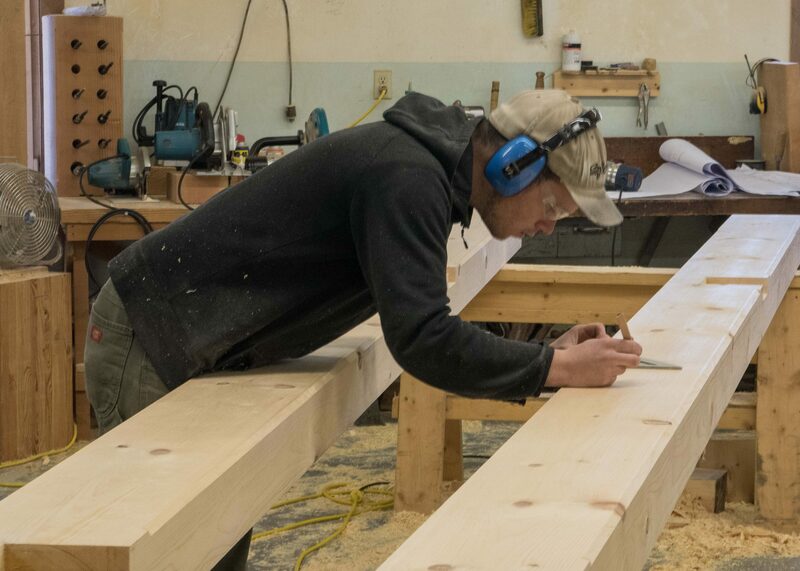 If we ship large trusses to an outside contractor, we will pre-assemble the trusses in the shop to make sure that all the joints fit properly before we ship the unassembled parts. 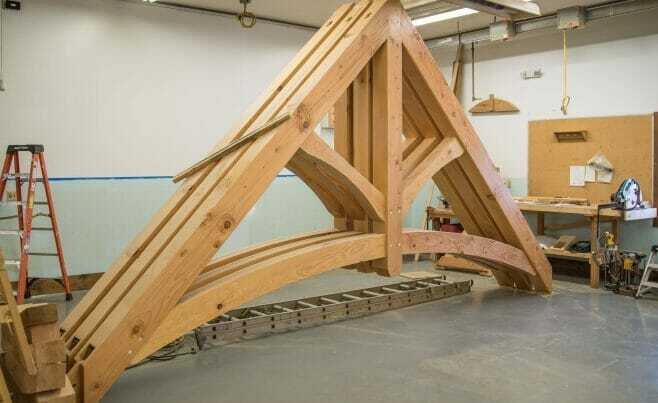 If the plan is for our crew to do a large truss installation then we will do the final fit on the job site. 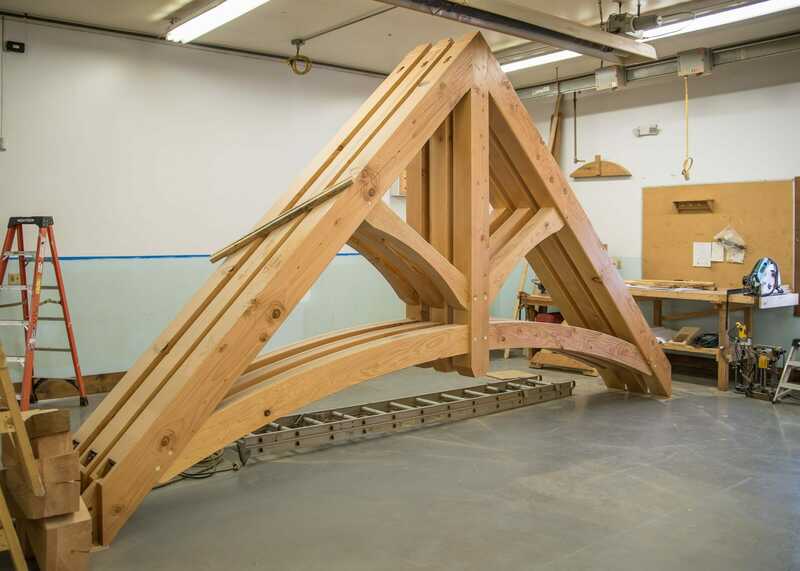 Assembled heavy timber truss will be prepared for shipment. 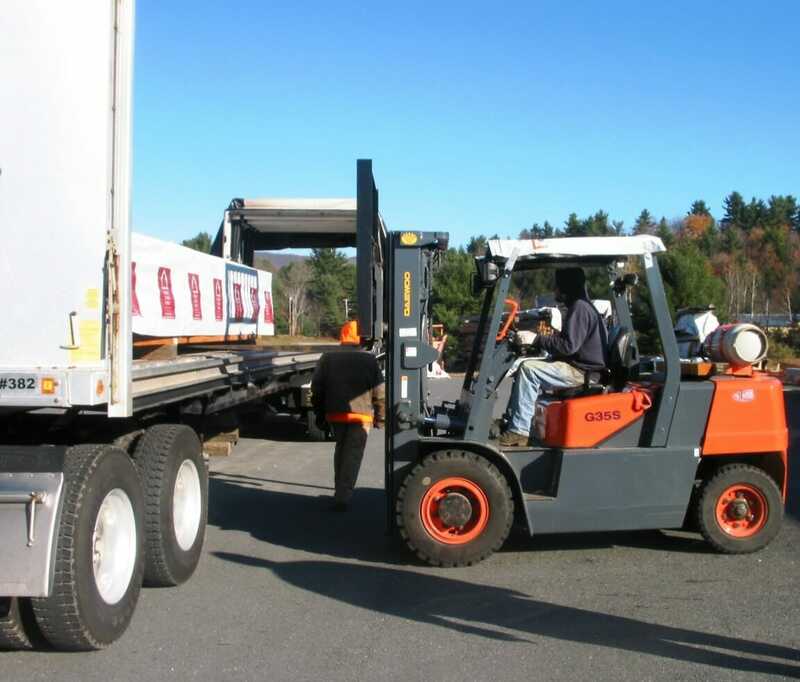 A forklift places paper wrapped beam packages on a tractor trailer truck to be delivered to the job site.